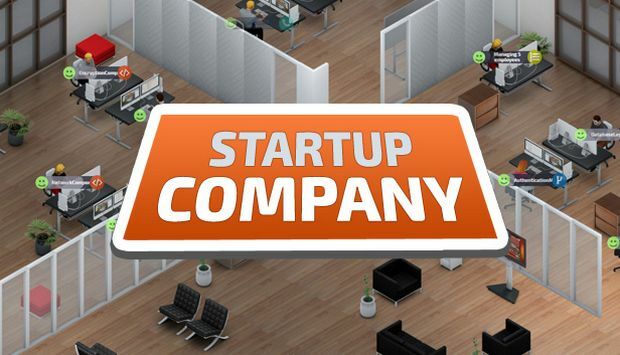 Startup Company is a business simulation sandbox game. 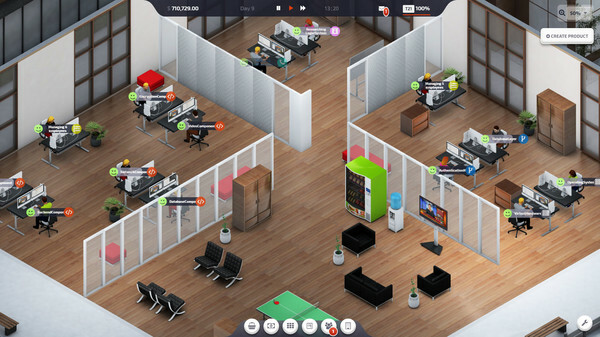 You play as the CEO of a newly formed software company. With an empty bank account you are forced to complete client contracts, but as soon as you get enough money you will be able to start competing against the largest tech giants, building your very own products and services. 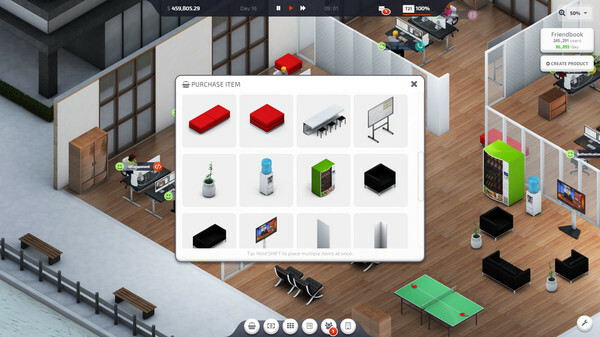 * Build Mode: Design your very own office. 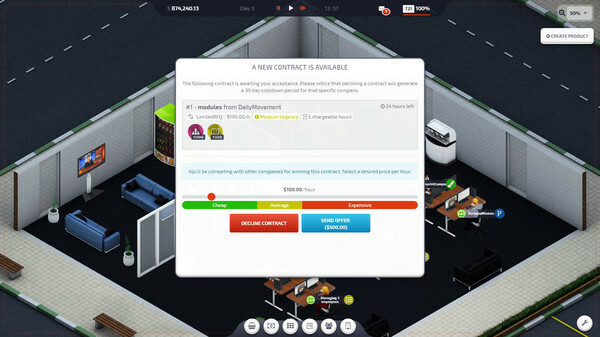 * Contract Work: Win contracts by competing on price and service. * Crafting System: Merge components to create modules. Use modules to create products. * Products: Build outstanding products by adding features, managing servers and running marketing campaigns. A great company is built by great people. 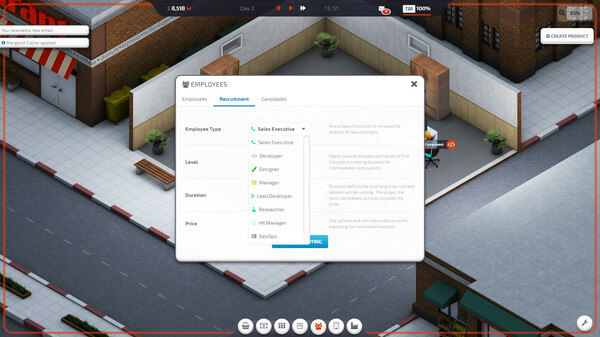 Optimize your staff benefits and working conditions to attract the best employees. You’ll be facing hundreds of available contracts, but not all of them will be good for your team. Work your way up and compete with the best in the industry to win the big contracts! That’s right, even software needs a little piecing together! No matter if you want to deliver contracts or build your own product you need components and modules. Use developers, designers and lead developers to produce what you need. 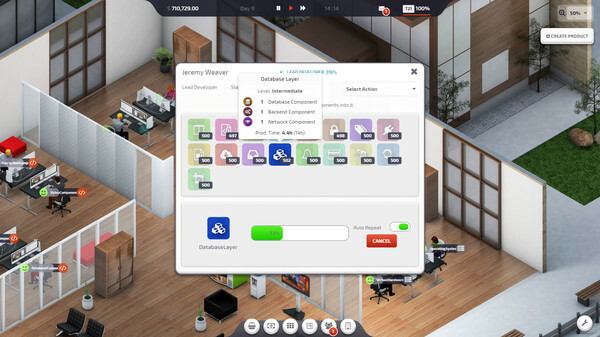 Startup Company includes a fully featured crafting/development system where you will be able to merge components into modules, servers or product features. Creating successful products is all about making the right decisions. Implementing or upgrading the right features is what generates hype. Hype generates users and users generate money. You’ll have to constantly pay attention to your hype otherwise users will start to drift away from your product. Keeping the product under constant development and releasing new versions is key to success. It’s your sandbox, let your imagination run wild! 1. Download 7-Zip or WinRar and install it. 3. Extract the game to your preferred location. 4. Wait for the extraction to end. 5. No need to install the game, just start with the LAUNCHER of the game as administrator.